When I last saw The Unthanks, four years ago at Darlington Arts Centre, the line-up was in the processs of fracturing. They were touring The Bairns album and it was a real mixed bag of a night - at times inspiring, at other times rather twee. Time for a spot of news from Blackpool. No you haven't strayed into the pages of Salut! Sunderland by mistake - Blackpool suddenly being what we thought we'd never have this season, relegation rivals - but are about to learn a little about a festival being held in the resort next month. It is a measure of my absences from England in recent years that I am familiar with none of the artists listed as taking part in Barefoot in Babylon, a one-day folk, blues and acoustic music festival on Saturday May 28 (by which time relegation will have been long settled). So I am going to take my informant Karen Duckworth's word for a lot of things here. First, that it is a "lovely" festival being held a quarter of a mile out into the Irish Sea in the stunning Victorian conservatory at the end of the North Pier". Can it be as long ago as 1988 that I received a phone call from Hughie Jones telling me the Spinners, formed way back in 1958, had decided to retire? In those days - and until 2007 - I wrote about folk for The Daily Telegraph. Whether the call was in 1988, the year usually given for their retirement, or a little later (fittingly, the band played before the Merseyside FA Cup Final of 1989 and more dates in the early 1990s), it was an awful long time ago. As I have mentioned at Mudcat, I remember it vividly for Hughie's mock-defensive opening line, before even introducing himself: "Are you a Spinners hater?" Folk music is littered with great duos – Swarbrick and Carthy, Shirley and Dolly Collins, Foster and Allen, - and Spiers and Boden can take their place in the Pantheon of Performing Pairs after a rousing show at The Sage, Gateshead on Sunday night. As a gloomy and disgruntled Sunderland supporter, I was desperately in need of a pick-me-up and the pair certainly gave me that, with their indie take on traditional music. One tall and thin, the other short and a little tubby, and both dressed in dark colours they make a great combination that melds Jon Boden’s very distinct voice with the melodic box playing of John Spiers. "I want your life!" said my young Canadian colleague, out in Abu Dhabi, in reply to a reminder of why I would not be available to work yesterday. "Or at least your concert tickets. In my mind, all the best music was written before 1979. And she was one of the best." She? A trim, handsome but slightly hobbling woman of 70, in leggings, white top and red rust scarf. She has been singing with beauty and conviction for a lifetime and my pass-out from gainful employment coincided with her show at the Dôme theatre in Marseille, where the photo was taken, between concerts in Toulouse the night before and, after a day's break, Grenoble. 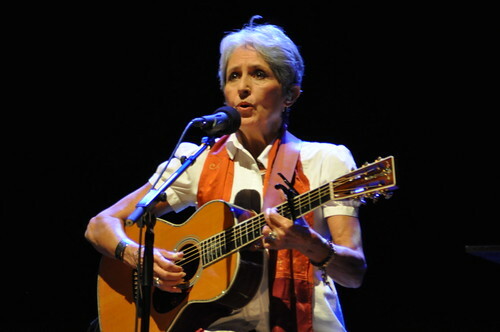 Joan Baez on tour.